As part of its climate resilience measures, Grenada has embarked on developing a new National Water Policy by reviewing the present one and at the same time developing a Drought Management Plan that will establish the necessary mechanism for the sustainable use and management of water supply and availability on the island. “The water policy when implemented will hopefully bring people’s perception to the reality that we will all be thinking of water as important and at the same time as a scarce resource. 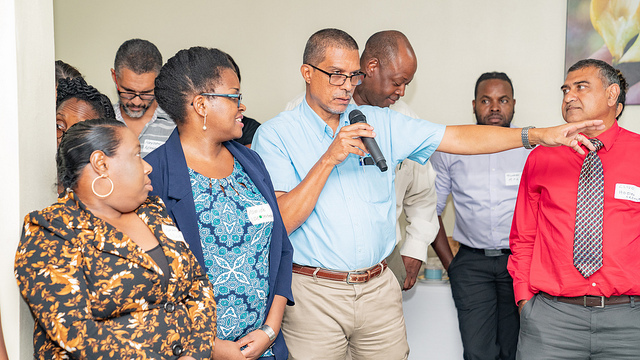 The policy is really to ensure that we have rational use, management and regulation of water,” said Dr Everson Peters consultant to the Grenada Water Stakeholder Platform. “We cannot manage without regulation,” said Peters who indicated that regulation is linked to use and is also of the opinion that the policy successful enforcement and implementation will be the responsibility of all users of water. “Through this policy, we want to ensure that we use water efficiently and at the same time minimise loses,” he said during a joint news conference held by the Ministry of Agriculture and key water stakeholders which include the National Water and Sewage Authority (NAWASA) and land use management. The goal of the drought management plan is to ensure that water is available for all during periods of drought. “First of all, people drink water, then we need sanitation because we don’t want diseases breaking out in schools because of a lack of water and then we want irrigation,” said Peters who believes that in times of drought the great impact is on women and children. In the face of emerging impacts of climate change on the water sector, one identified activity of G-WaSP was the review of the Grenada National Water Policy. Terrence Smith and Dr Everson Peters were commissioned by G-WaSP to review the National Water Policy. In the last months, the consultants met with a number of stakeholders in focus groups to capture their perspectives for the review of the Water Policy, and to draft the revised National Water Policy (2019) which is expected to be presented to the Cabinet by early March 2019.